SayIt! 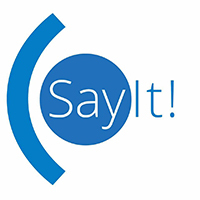 is an Augmentative and Alternative Communication app available for iOS and Android. It was designed to provide a fast way for people with disabilities to communicate. The app includes a fully functioning word prediction system allowing the user to type what they want to say at a relatively fast rate. The app is currently offered free of charge. The app provides a text to speech feature. This can be activated by selecting the button with the speech bubble icon on the keyboard. There are multiple settings including a choice of voice and the rate at which it speaks. The app provides support for switch users. This is an alternative way of accessing technology that many people who are physically disabled use. It allows them to select a keyboard button by sequentially scanning each one. When the desired button is highlighted, the user presses a physical button called a switch. Word prediction can be used in two ways; with the Short Predict feature turned on or off. Short Predict allows the user to type abbreviated words and have the word that they want be predicted. It does not matter what letters the user types as long as they are in the correct order. When Short Predict is turned off, the user can type part of the word and the desired word will be predicted. The more you use a certain word, the more that word will be predicted.